I was going to welcome you to a fresh new Monday, but Monday has already slipped its way into Tuesday for many of you, so may I just say I hope your week has started off well and stays well throughout! We had a busy weekend of household mediocrity followed by the exciting arrival of company in the form of long-time-old-timey-friends. We're at that age where conversation consists of half-present-day and half-bygone-day dialogue. It's a nice balance, but without saying so in so many words, we all feel the pull into Geezerville. It didn't help when I asked the nice young waitress if they could turn down the music. And that's how it begins. We four looked at each other in horror, Mister called me a cranky old bag, and then we burst into raucous laughter. You see how I purposely used the word raucous there because in common dalliance the word is usually followed by "youths." I'm a rebel like that. A delusional one. I immediately pictured this awesome deck chair as my card focus pocus, with two loops of wave on each side. Then, since I'm trying to excavate Mt. NBUS, I had Hammy go through the embossing folder binders and let me know if the card needed a little embossing interest. And here is where the hamster shines. He hands me this NBUS embossing folder which is meant to be long grass. I cocked my eyebrow and he laid flat out on his tummy with his paws stretching out front and back. Ah ha. I turned the folder sideways and saw what he saw. Ripples in the sand left by receding waves. Do you see it now? I have to say I thought it was pretty cleaver myself. The deck chair is made by Technique Tuesday and the NBUS little wave is from a Paper Smooches set called "Surf and Turf." As it happens there is an "Anything Goes" challenge happening at Paper Smooches Sparks challenge blog. I admit it's stretching things a bit to enter with just this wee itty-bitty wave stamp, but hey, it's a stamp and I'm happy to let you know about this fun set which includes an ocean wave, just when you need one. 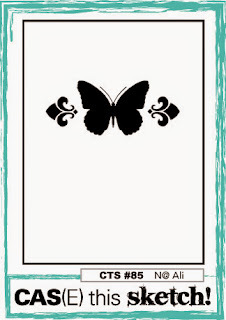 And over at Simon Says Stamps Monday Challenge, the brief is "A Mid-Summer's Challenge." And, finally, the current theme at Addicted to Stamps and More is CAS (clean and simple), which I love. I hope you can join in some or all of these challenges! The links will take you to the challenge headquarters where you will find all the information regarding rules, sponsors, and prizes. Edited to add: So a few of my eagle-eyed crafty friends told me that the "grass" e/f is really supposed to be horizontal and it is supposed to be "branches," not grass. Apparently we were vertically challenged while looking at the e/f and not even paying attention to the direction it was going when running it through the BS! Oh, well. We thought we were really cleaver there for a minute! But we still think the branches make great looking ocean ripples in the sand! And, my friend Diane of 1 Card Creator has invited me to join in the Craft Hoarders Anonymous challenge, "Who's the Boss?" Thank you, Diane! It's my first time joining in this fun challenge! I am so happy to welcome five more new friends today! I'm especially delighted because three out of four of the blogs being introduced today are all brand new bloggers!! So I do hope you will take some time and pop in to leave some love for these newbies. We never forget how scary it is to start up a blog! Laura Jane of After-Hours Ink and Flowers. What a fun name! LauraJane is from Missouri and she only started sharing her creations on her blog this past April, but she is already an award winner! 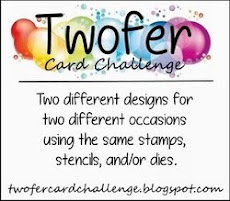 She's an excellent card artist and challenge participant who has lots of inspiration to share with you. I would love to have you take a few minutes to visit LauraJane and make her feel welcome! Colleen. Welcome, Colleen! There is no link from your name in my follower thumbnails to a blog and I don't see an email comment from you, and with only your first name, I can't find you on Google. If you have a blog that you would like me to share, please email me to let me know. If any of you recognize Colleen's smiling face and have any information, please let me know. My email address is on my profile page which you can access via a link following the text under the photo of the Playhouse. Riette of Red's Card Corner. 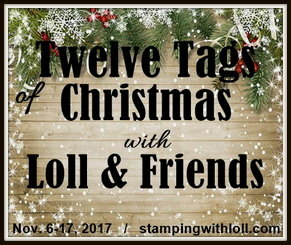 Riette has been blogging and amazing the stamping community since 2011! 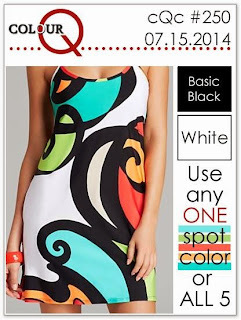 She is a designer and award winner and I love the designs she creates from the challenge briefs. She also has a thoughtful page regarding getting started with card making. I think you will enjoy your visit and return again and again! Sandy Iverson of Sandra's Creations. 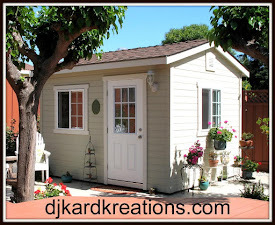 Sandy gets the prize for newest of the newest bloggers today as she just started her blog in May ~ only eight posts ago! I may be closing in on my 700th post, but I still remember my first few posts like it was yesterday! Sandy is an Australian transplanted to Texas and the mother of two adult children. She and her husband are transitioning to empty-nesters and this is a great opportunity for Sandy to become immersed in this fulfilling hobby! Janis Woolbright of Her Peaceful Garden. Janis is also a newcomer who has only been blogging since February of this year, so your encouragement would be terrific! Janis lives in Idaho and loves making cards and cats. I mean, she doesn't make cats, but you know what I mean! I think you will enjoy your visit to Janis and she will make you feel most welcome there! In honor of the ripples under your chair, I stretched out on the floor like the hamster. Now I can't get back up. Great CAS, and good choice, Hammy! Well my friend I guess I am now officially in geezerville to! I say this because I knew what you meant when you used the word raucous! So I will throw in a textese ROFLMAO, just to appear younger here! LOVE LOVE LOVE your card, that chair is so fun Darnell. Thank you so much for sharing with us this week at the colourQ! Love the embossed effect -- smart hamster there! Love the embossed affect. Is it a special teqnique? Fabulous card, Darnell! That embossing folder is pure genius! Hammie is seriously rocking the inspiration...the embossing is truly fabulous. This is an absolute CAS beauty! Wow Darnell! Darnell, this is super fantastic!!! Love the embossing on here and what a peaceful and wonderful image. Great card! Glad you had a good weekend and I know all about Geezerville too. I need your hammy - I would have never seen waves in this - but it is perfect! Darnell...as always, I love, love reading all that you write and this is no exception my sweet friend. So happy that you found time to play in your adorable playhouse, this is about as sweet as they come. I love that embossing and that chair, I could spend hours sitting in it. As for geezerville...NO WAY for both you and Tracey...you two crack me up! You are only as old as you feel and just because you wanted the music turned down means nothing, I would do the same if it was something I did not like...LOL (hoping that makes me sound young too)...Sending hugs your way! You and Hammie make a great pair. I have an old embossing folder that looks remarkable like this and IS sideways. It worked great for this beachy card, which is a wonderful interpretation of the sketch. ROFL at Mary Anne's first comment! LOL You and hammy really have a wealth of cardmaking pizzazz between the two of you, but this one is just genius! Way to use that ef to it's full potential! Great card! This card caught my eye right away at the paper smoochies sparks challenge...then I saw it was yours! I love it! This is such a stunning CAS card, Darnell...Hammy is such a great friend to you! I love how you embossed along the bottom, and the Adirondack chair is the perfect focal point with the waves along the side! Thanks so much for playing along with us at ATSM this week ~ I really love this 'Beachy' card!! Your card making is fabulous -- Your description of how Hammie showed you how to use the embossing folder is priceless -- Have you seen the tv show Perception? Hammie would love it! But really, your card is great! Absolutely brilliant and inspired design, Darnell! Love! I can see the waves and they look fab. This is a wonderful card, Darnell! Great card Darnell and thanks for the memories! What a fun story Darnell, from one geezer to another, you gave me a good laugh!! Your card is a perfect mix of CAS and summer! Thanks so much for joining us at the ColourQ! Oh, what a wonderful card, Darnell! Great take on the sketch! I love that sweet chair! Well, if the raucous music damaging my ears - and discombobulating my thoughts - is indicative of entry into Geezerville, then I certainly am welcoming myself into the neighbourhood! I'd be delighted to share companionship with you! Your card - with Hammy's brilliance navigating you to 'new perspectives' - is fabulous. LOVE X LOVE it; that chair is so inviting! And now, I have the absolute honor and delight to say: thank you so much for sharing this gem at ATSM! CAS and awesome! Brilliant! What a team you and Hammy make :-) Love the flat out stretch technique - you do make me giggle Darnell. Wonderful card Darnell. I love the image and your Hammy is so helpful to give you the fabulous idea to use the embossing folder in a different way. Really like the card. I really must do more embossing. I too have recently requested music be turned down so I'm on the bus to Geezerville too! What a clever Hammy, to find that brilliant embossing folder which perfectly complimented your deckchair to make such a splendid card! YAY Hammy!!!! What a fabulous card Darnell! Love how you used that embossing folder - great work Hammy! Fabulous card Darnell! Love how you used the embossing folder sideways, I do that too! I LOVE this card. And such a gorgeous colour too. Fab CAS card Darnell! Love the bright colour border! So effective! Brilliant used of the embossing folder Darnell and a gorgeous card which would also fit in perfectly with this week's Make My Monday challenge. Sorry I can't add link as I'm using tablet not PC and haven't worked out how to do it yet! Whew this old geezer had to sit down by the time I got to the end of the comments. Now what was I going to say? Hhmmm oh! Great idea hammy! Love the effect of sideways embossing. Stunning Darnell. What a brilliant idea to use the embossing folder accross the card. A simple C&S card with with a big impact. Perfect folder for sand effect!! Love it, D! I absolutely love the embossing folder you have used on this fabulous card. Fantastic clean and simple card. I always think embossing folders add a little something extra to a card and have to confess to owning quite a large number of them. I love the ripples - great way to stretch your die! I love the chair and the look of your card - so tranquil. Sounds like you've had a great time with your long-time friends Dippy.......we've just had some very long-time friends staying with us as well (they actually introduced Tony and I to each other........not quite sure which one of them to blame!!! lol). Love your beach themed card and how ingenious of Hammy to nudge that e/f sideways to show you another way to use it.......brilliant - I thought it looked like waves in the sea, but equally could be the sand rippling. Wow,this CAS card is so gorgeous~ I love the design and the CAS style. Thank you for sharing this card at ATSM. Hammy was right on the money when he picked that EF! What a gorgeous card, Darnell! I love your take on the sketch and how your card is a true invitation to enjoying the summer! Perfect CAS card there you "Cranky Old Bag" - just teasing! I'll be nudging "Geezerville" soon enough but intend to practice AGE WITH ATTITUDE at all times! What a great idea to turn the embossing folder on its side! I might have to CASE you on this one! Hope you're doing well. I miss you when you're not around. Cleaver's right...this one cuts to the CAS chase. It really doesn't matter if it came from Hammie or your alter ego. It's AWESOMENESS personified. I think I may have that embossing folder and you've given me an idea. Gotta go think about it some more. Love your card! WOW You need to get Hammie his own chair and ink pads etc. He is really a great designer. I mean who would ever think to turn tall grass side ways. Hammy and I must be on the same "wave length"! Ha! I saw the rippled sand or water right away. This is awesome! So perfectly CAS! Such a clever and great looking design! Love your creativity with this embossing folder! I saw the rippled sand right away too! You and Hammy have splendid ideas! You made a super calming summery beach scene! Love your CAS card with the great classic east coast Adirondack chair. I love the embossed ripples which give the illusion of waves below the beach chair images. Cool idea for a quick card design which packs a punch. Thanks for the new follower highlight..You have written a better bio than I ever could! WOW, Darnell!!! You are, ....sorry I mean Hammy! !, ...is a genius!! Only a genius would turn a grass EF on it's side and use it so brilliantly to represent ripples in the sand!!! Your card is a winner - ...love the deckchair and the little waves!!! Lovely interpretation of the sketch!! As always your post was such a pleasure to read and had me LOL - sounds as if you had a lovely time with your friends!!! I think Hammy was particularly brilliant to use that embossing folder as waves - such a wonderful idea!! This card is calm and serene and makes me want to be sitting by the sea, listening to the waves go in and out!! Beautiful card and great for so many challenges!! That is awesome!! I predict a winner here, Darnell, this is inspired! Well done Hammy for pointing you at the right NBUS. And raucous is definitely not exclusive to yoofs! Welcome back. Your brief respite from card making did not hinder your creativity one little ioda. We too had company this weekend friends for forty two years. When we were in our twenties and thirties we started a bridge group and now sadly two couples and four widows remain. But my what fun we had drinking, eating, shopping and talking of days long ago. Your card is delightful and I love the EF. Love this CAS card -- so pretty! What a creative way to use an embossing folder. You are BRILLIANT! What an amazing idea for that EF....this card ROCKS! Grass....branches.....sand.....waves.....it's all good. In my case, they would be wrinkles! Thanks for the shout-out. Hugs!!! Made me giggle again....I ask the hairdresser to turn the music down!! And this is a joy of a card. So gorgeously CAS and I love the ripples of sand. Oh and just noticed you entered it into ATSM so thanks for joining us hon! This is a brilliant card!! I thought it was genius to turn the folder ... even if it was meant to be that way ... or not ... Love the chair!! Grass? Where is the grass? Hammy knows best, he is totally cool! :). Good to have you back, Darnell! Love your card... great chair, peaceful waves and no words to clean the mind... it makes me want to go on vacation, desperately :). Long grass-looks good, ripples-okay, branches-not on the beach, hammy to help-priceless! Cute card and I love the chair. We don't like places with loud music because we are half deaf anyway. Probably from the loud music! What a fab CAS card! I love the 'ripples'! brilliant idea! Glad you are back from your brief break. Your beach chair looks so inviting! I will be relaxing on a cruise chair on the deck to Alaska! Oh that is the greatest embossing! LOVE all the white!!! It'S a super card Darnell, love the way you used the embossing plate, branches or not, the embossing finishes off the card beautifully. Brilliant card Darnell, how clever of Hammy to show you the best way to use the EF! If he ever fancies a holiday across the pond he will be very welcome:)Your anecdote about your old friends was just like the week we spent with our old friends as Angela and I spent so much time trying to remember names of ex colleagues our heads hurt!! Ok. So I have a piece of gum(blu tac), some straw and a half eaten Crayola yellow #12. (Boy do they taste discusting!! )Bit stuck on the inside liner of a dog food bag cos I don't own a dog and the cat died. I'm taking it that the bag of food is dry biscuits cos this could get a bit messy other wise. Will the inside of a jiffy bag suffice? This is sooooo my favorite card of yours! Brilliant! I love that chair and brilliant idea to emboss. I had to laugh that this is for PM ,love it! Yay for Kay ,I must try and play. Sounds like a wonderful visit with friends. This is incredible and the embossing is such a genius idea, it really makes it stand out. I thought it was a really fiddly die-cut. Amazing!!! Dude, both you and your friend have been smoking the grass.... that's a rippling wave embossing folder if I ever saw one!!!!!! Seriously, I thought it was grass. And I thought you were super brilliant (well, Hammy was) for coming up that the idea. Simon Says has a stencil for waves along those same lines so you rocking it by using what you had to get the same (actually better) look. Great card...You are always so creative with your cards! I think I missed this first time round darnell - gorgeous take on all those challenges. The NBUS emboss folder grounds the chair so well. Thanks for playing along with Colour Q again! Love this card, Darnell, love how you used the colors and the folder is perfect. Just because the folder might be one thing, doesn't mean you can't use it for something else! 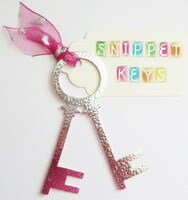 Perfect for your card! so happy to see you at the colourQ. Stunning card! The use of that embossing folder is so clever. Thank you so much for sharing with us at Simon Says Stamp Monday Challenge Blog!! Beautiful CAS card. I love the embossing at the bottom. Thanks for joining us at CHACB! Creative use of the embossing folder! Love your card! Thanks for joining us at Craft Hoarders Anonymous! Beautiful, love the embossing work! Thanks for joining us at Craft Hoarders Anonymous! Oh I can almost smell that ocean air and feel the mist from the waves! Love how you've used the embossing folder. It adds the perfect texture! So glad you joined us for our challenge at Craft Hoarders Anonymous! I love that you used the EF in a different way! I am looking at all my folders with new eyes, thanks to you! This is so pretty! I love CAS cards, mostly because I cannot make them! So I am drawn to them like a moth to flame! Thanks for playing along with us a Craft Hoarders Anonymous! I love the way you used your embossing folder. This card is so soothing and serene! I just love it!Thanks for joining us at Craft Hoarders Anonymous!